You've had a tree removed or it fell on its own and now you're stuck with an unsightly stump! Tree stumps are not just unsightly, they can be dangerous. They may spread disease to healthy trees and shrubs. 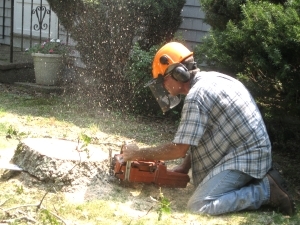 Stump grinders are specialized power tools that contains a high-speed disk with teeth that grind the stump and roots into small chips. We have the right equipment to get the job done. With A to Z Treez your stumps will be history.